Since 2014, Círculo Salvo has worked together with the Pan-American Dairy Federation (Fepale, by its Spanish acronym) towards professionalizing its Pan-American consumption of dairy products campaign. The aim of Yes to Milk! has been to promote adequate consumption of milk and dairy products in the region since 2008. Strategically, this link has been useful to recommend, assess, and implement a series of infrastructures and actions which maximize the campaign’s discourse and its position in view of several different actors: Yes to milk! is no longer directed solely at Fepale members (Latin America and the Caribbean dairy production chain stakeholders) or interested specialists –i.e. experts, nutritionists); it has now incorporated end-consumer to its aim. This has led to the development of an online platform (sialaleche.org) to publically introduce and support the campaign with downloadable educational materials, news, technical articles, and other input. These materials are methodically promoted through social media (Facebook, Linked In, Instagram, Youtube), based on defined strategic contents and a pre-established schedule. Visually, this new stage for the campaign involved the renovation of its visual identity, which included the definition and formalization of the graphic brand and user’s manual, as well as a visual universe that feeds the campaign across all media. Several elements were created for tactical purposes: press releases, posters, brochures, measuring rod, stickers, presentations, paper toy, among others. After setting new standards and launching the campaign, the challenge has now moved on towards its outreach and performance as well as a brand culture construction. In this sense, the management, strategic definition and implementation of steps to be taken, have been fundamental. A special project on recipes was developed to successfully reach the home: where nutrition decisions are actually made. With this concept as a flagship, in 2015 and 2016, Yes to milk! carried out a recipes series in its Youtube channel and a Pan-American cooking competition: Latin America cooks with dairy products. 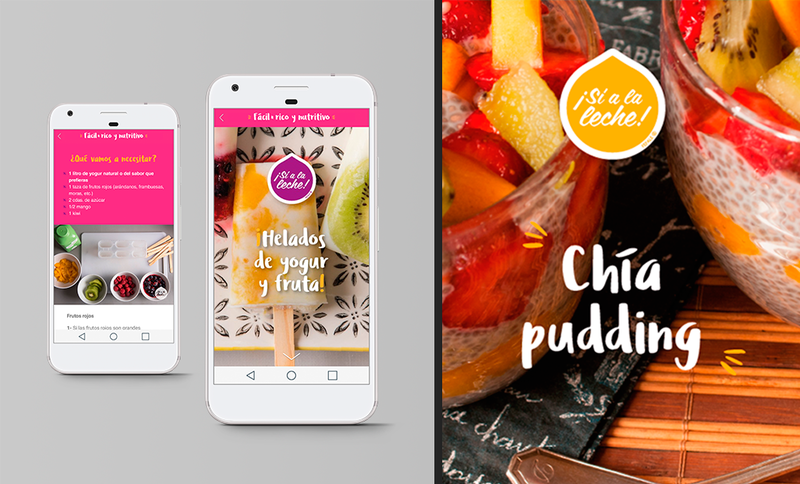 In 2017, after the success of the first series, a new one called Easy, tasty and nutritious was effectively launched, specially produced aiming its dissemination among Facebook’s mobile phones users.